Every fireplace needs a proper clean every now and then. Not only does this keep it looking good, but also ensures everything is kept in proper working order. When it comes to cleaning your fireplace, the type of fire and material you have will decide how best to go about it. If you have a marble fireplace, you will need to take extra special care. 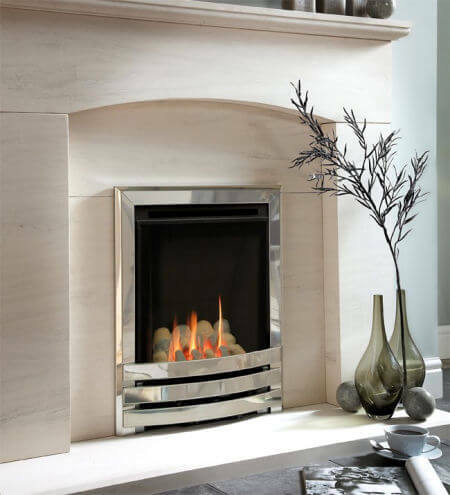 Read our guide on how to clean marble fireplaces & surrounds to find out more. If you find your fireplace is looking rather too worse for wear, it may be time to replace it. This could just be a case of updating the fire surround or refreshing your room with a whole new fireplace package. It’s not only solid fuel fireplaces that need cleaning. Even though you don’t have a chimney full of soot, your gas fireplace will still benefit from having a regular clean to keep it burning as bright as possible. While gas burns much cleaner than wood or coal, you will still need to get your chimney inspected, ideally once a year. This is because debris can still gather and cause blockages – or, birds could set up inconvenient nests which prevent proper ventilation! If your chimney is old, you might also be susceptible to dampness, so it’s best to get it checked out at least once a year. One of the most commonly asked questions, though, is how to clean gas fireplace glass. Over time, dust can get trapped and the glass can start to appear cloudy. New gas fires also sometimes become foggy as products used during manufacturing ‘burn off’, producing a white film. A good clean will be in order to make it look like new again! Obviously, the first thing you should do is turn off your fire and ensure it has cooled down completely. You should then turn off your gas supply to ensure no accidental gas leaks happen. Most gas fires should allow you to remove the glass, but if you’re not sure, take a look at the manual. 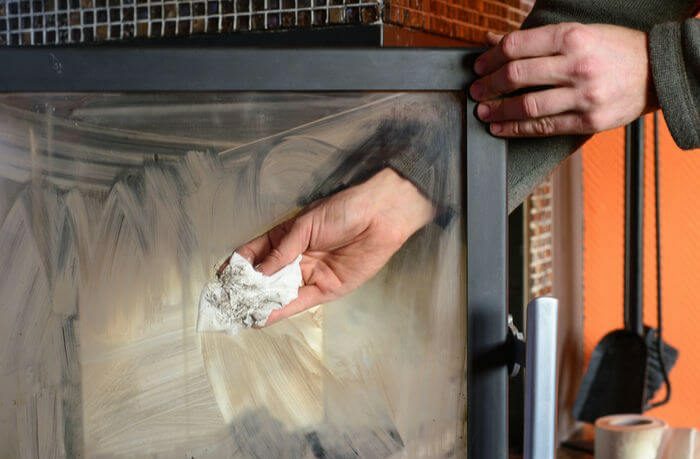 Once removed, use a fireplace glass cleaner to clean the inside of the glass. You shouldn’t use a regular window cleaner or ammonia based solution as this won’t react well with the combustion particles inside the fire when it burns. While the glass is off, it’s also a good idea to dust the logs or pebbles inside with a soft brush before putting it back together again. Cleaning the inside of your stone fireplace should be an easy enough job. Make sure your fire has been extinguished for about twelve hours and lay down protective coverings around the hearth. You should also wear goggles, a dust mask and gloves, as soot particles will be disrupted into the air. Your first job is to sweep up the ashes with a dustpan and brush. You could also use a vacuum cleaner with an attachment to gather up the stubborn bits. When it comes to cleaning products, a mild soap or multi-purpose cleaner are both suitable. For more stubborn stains, a mixture of T.S.P crystals and warm water can be used – dab it on with a sponge and leave for about 10 minutes before removing. Make sure you give everything a good wipe down with plain water when you are done to remove any residue. If you have a limestone fire surround or fireplace, be aware that it will be very porous. You will need to be more gentle when dealing with limestone than regular stone, so use a soft microfibre cloth and watch out for debris that could scratch it during cleaning. You should also avoid strong chemical cleaners, and use only mild soap or a special limestone cleaning solution. Waxes and sprays can cause dark patches to form, so check if they are suitable before using. When cleaning, don’t scrub at the stone, but use light circular motions. To prevent your limestone fireplace from staining, you should apply a limestone sealer once a year. To apply it, you just need to make sure your limestone surround is completely dry before laying on an even layer with a soft brush or rag. Find out more in our complete guide to limestone fireplaces. Cast iron fireplaces look very durable, but are more sensitive than you might think when it comes to cleaning. 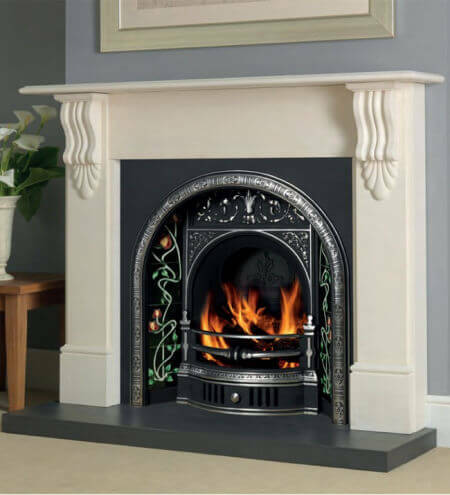 Whether you have a cast iron surround, a cast iron fireplace insert or a cast iron combination fireplace, you want to keep it looking its best. The biggest concern when it comes to cleaning a cast iron fireplace is the potential for rust to form. Exposure to moisture can cause iron to react with the oxygen in the air, which can result in an unsightly layer of rust! For this reason, you should not use water to clean your cast iron fireplace or surround. If you spill anything on it, you will need to be dry it thoroughly and quickly to stop rust setting in. If you notice rust has already formed, don’t worry too much, as it can probably be removed. Using a wire brush or wire wool, you should only need a bit of elbow grease or rust remover to get rid of it. If it needs a further wipe down, use white vinegar instead of water to scrub off any marks. Once you’ve cleaned up the surface from dust, marks and rust, it’s a good idea to polish your cast iron fireplace to protect it and bring it to life. Cast iron can look dull, so using some grate polish can add a shine and depth to the detail of the surround. Using a soft but strong rag that won’t tear as you use it, buff the polish up to a light sheen. You could also use a stiff paintbrush to get into nooks and crannies. 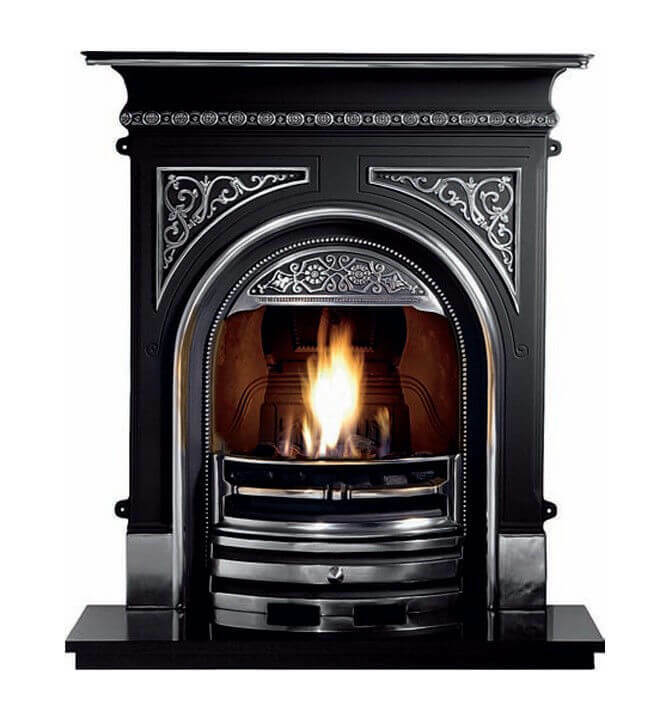 Take a look at our full range of fireplaces if the time has come to replace yours! If you need any help, contact us to speak to our friendly sales team. Should You Convert Your Open Fire into a Gas Fire? Do You Need a Chimney to Have a Fireplace?